The whole argument can be explained with the where MC is the marginal cost curve and MR the marginal revenue curve. AC ami AR are the average cost and average revenue curves respectively. At the output OM. marginal cost equals marginal revenue (MR and MC curves intersect at E above this point). This represents the point of maximum profits and hence of equilibrium. At outputs smaller than OM. 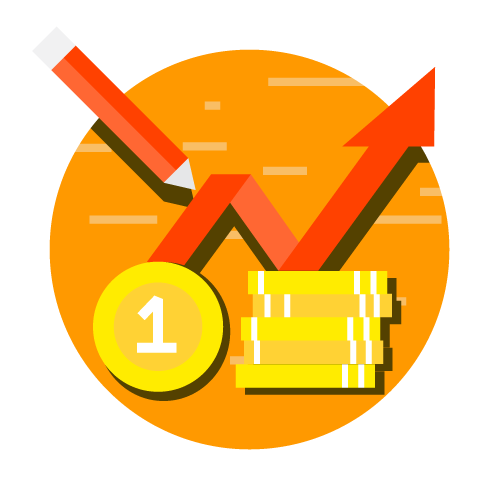 marginal revenue exceeds marginal cost and hence-there is scope for increasing profits by increasing output. For example, at output OL, marginal revenue is LG and the marginal cost is LH. and LG is greater than LH. It means that by producing the L1h unit, the firm is adding more to revenue than to its cost and, therefore, it will be profitable for it to produce the L1h unit. Similarly, for evcry other unit till the Mth one, the marginal revenue exceeds marginal cost, and, therefore, the firm can increase its total profits by producing up to OM output. If the firm stops producing at OL, the units of output which could have added more money to thc firm’s revenue than to its cost would not have been produced and profits would have been smaller by the area GHE than they could have been. Thus, a firm has an incentive to produce up to 0 1 level of output. Hence, we conclude that firm’s profits at OM output are the maximum and that’ limn when laminar Ctlt libidinal This is one condition which is necessary but which is not sufficient for equilibrium. the total profits earned by the firm in the equilibrium position The easily found. At output OM, the average cost iDM while the average revenue is QM. Therefore. the profit per unit will be equal to QD and the total profits will he equal to the rectangle DIRT. At an equilibrium position, the curve t cut the The condition that for a firm. Librium marginal cost must equal marginal revenue is no doubt a necessary condition but not a sufficient condition of equilibrium. For attaining equilibrium, a second condition must also be satisfied, ‘. ;z., that the marginal cost (Me) curve must cut the marginal revenue (MR) curve from below at the point of equilibrium. This means that, beyond the equilibrium output, marginal cost must be greater than marginal revenue. If this condition is not met. a firm will not be earning maximum profits and hence will not be in equilibrium. 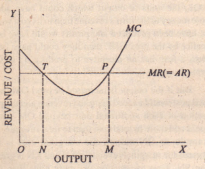 as we shall see in the diagram below the point E (i.e., output OM) satisfies this second conditions also, as the Me curve cuts the MR curve from below at E and Me is greater than MR beyond E. It will be clearly not profitable. therefore. to expand output beyond OM. But there can be such a cost-revenue situation, which satisfies the first condition of Me being equal to MR but the second condition of Me cutting MR curve from below is not met. the period is short or long, a firm aims at maximisation of profits and the profits arc maximised only when the above two conditions are satisfied. But there is one difference. 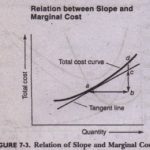 In the short run, it the short-run marginal cost curve and in the long run, it is the long-run marginal cost curve which is relevant for comparing with the marginal revenue curve. Again, these two fundamental conditions, marginal cost being equal to marginal revenue and MC curve cutting MR curve from below, are valid whether a finn is working under perfect competition, Monopoly or imperfect competition. The difference lie only in the shape of the marginal revenue and marginal co t curves. Under perfect competition, MR and AR curves are horizontal straight lines and they coincide.but under imperfect competition MR and AR curves are downward sloping.